The challenges that organizations face today are increasingly more complex than in the past. The constant change of the global economy, dynamics of business risks and opportunities, and an increased threat of cyber-attacks add complexities we’ve never faced. 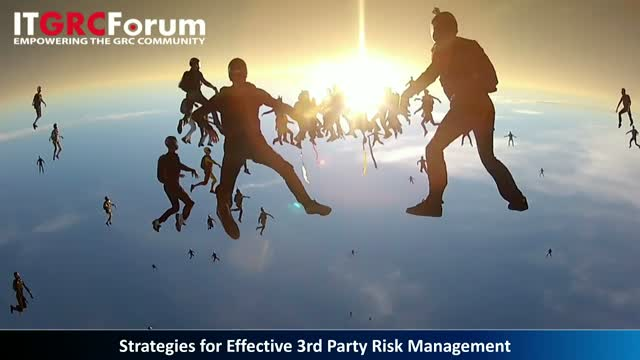 As organizations rely on more and more third parties to grow and thrive, they’re exposed to higher levels of risk, and regulators are focused on the need for organizations to manage 3rd party risk more effectively. Manual processes, silos in contract administration, and technology and resource constraints can all lead to significant errors in the third party supply chain that leads to violation of privacy guidelines and security breaches, which cause substantial fines, penalties, and damage to brand value. On this webinar our panel of experts will discuss the risks and repercussions associated with third party contract management shortcomings, common gaps in third party contract management processes, examples of how new solutions and technologies can help organizations optimize their third party processes, and effective strategies for managing 3rd Party Risk. Scott Roller, Founder of 3WP; Rebecca Herold, Privacy Professor; Sam Kassoumeh, SecurityScorecard. James Christiansen, Optiv. Presented by: Scott Roller, Founder of 3WP; Rebecca Herold, Privacy Professor; Sam Kassoumeh, SecurityScorecard. James Christiansen, Optiv.